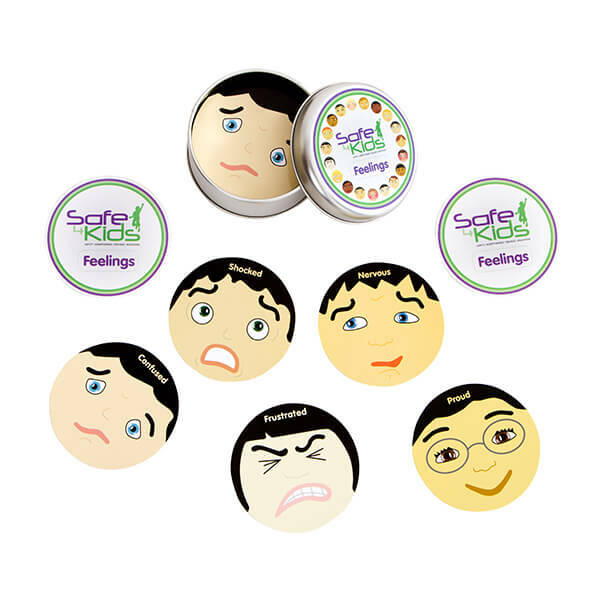 Our Feelings Cards Game tin is full of fun multi-cultural faces depicting 30 different feelings which will help increase children’s feelings vocabulary. There are two copies of each feelings card, one with the name of the feeling on it and the other card has the name of the feeling missing. There are instructions for 11 games which can be played with the cards. The games are – Concentration, Pairs, Magic Bag, Snap, Charades, Fishing, Go Fish, Detective, Synonyms, Sorting and Role Play. Also included are the definitions of the 30 feelings: Angry, Ashamed, Bored, Bullied, Confused, Depressed, Disappointed, Disgusted, Embarassed (sic), Excited, Frustrated, Guilty, Happy, Hate, Hurt, Jealous, Lonely, Love, Nervous, Proud, Sad, Safe, Scared, Shame, Shocked, Shy, Sorry, Surprised, Unsafe and Worried. Expanding children’s feelings vocabulary can assist in protective behaviours education, as it helps children express their emotions if they are feeling unsafe. Other items in our feelings and emotions range include our Feelings Bingo game and Feelings Poster.